Pets, like human beings, love the comfort of a warm, cozy bed. Manufacturers of dog beds design them with their needs, habits, and preferences in mind. 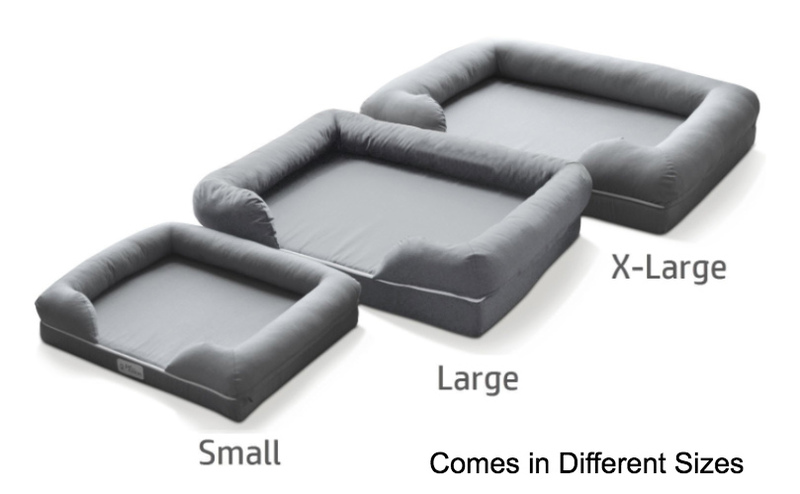 Some replicate human furniture, while others are simple foam orthopedic cushions that will keep them comfortable. Pet beds can be a practical, yet stylish addition to your home. If you have never pampered your pet with a bed before, you may need to know how to choose one. Bear these tips in mind when selecting the best bed for it. 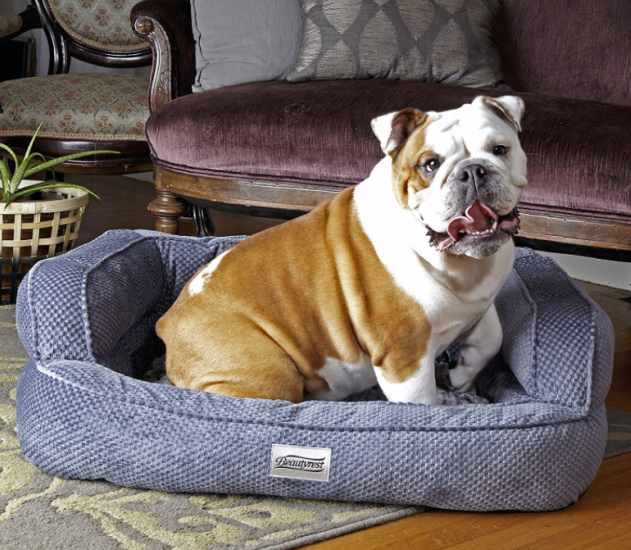 Here a few dog bed recommendations that will please you and your pet. 1. Take your dog’s length and weight. Your dog, of course, must be able to fit into its bed. The first step to buying one should be to take your pet’s weight and measurements. Have a tape measure ready, and record its length from its nose to its tail. Consider that your pet may like to stretch and lounge. If it does, you may want to get a long bed. If it does not stretch much, it may prefer a more rounded one. Take its weight into account as well. Hefty animals need to rest on thick, dense cushions. To avoid spoiling the look of your home, experts advise that pet beds should be part of the furniture. Consider where you will put the bed. Your decision will affect the size and style of the one you pick. If for example, you want to put the bed in your living room, you may wish to choose beds with soft cushions. A soft, doughnut dog bed will be ideal. Pick colors that blend with your existing furniture. Should you want to put it in your bedroom, you may want to consider a raised dog bed that looks like your own. Pet beds vary in color and style as much as human furniture. They come in colors and designs to suit all tastes. You may want to match your brown sofa with a bed that is forest-green. Alternatively, go on the wild side. You may want to get a bed that contrasts with the rest of your furniture. Animal print beds, for instance, will differ with a room that looks more urban and modern. In all, have your decorating tastes and preferences in mind when picking a dog bed. Get a bed with features your pet needs. If your dog has arthritis, a raised bed will be impractical because of the climb. It will need beds with padding. There are heated beds that will suit dogs like the Chinese Crested, which has little hair. Should you have a dog which is prone to heatstroke, you may need a cooling bed. Some dogs, like Daschunds and West Highland Terriers, love to burrow into their dens. They enjoy crawling into secluded areas to sleep. Hooded beds suit them best. If you go on road trips with your pet often, you may want a kennel dog, or caged bed to keep it safe during your journey. 5. Look at the washing instructions. Dogs will become messy on occasion. Their beds will need regular washing as human ones do. Most of them come covered in machine-washable materials. Make sure that you read the washing instructions, or they will ruin the rest of your laundry. Remember to separate the bed from the rest of your clothes when washing it. Do this if you want to avoid getting pet dander, hair, and odor into your laundry. Machine-washable materials are excellent because they will absorb messes. The dirt and grime your dog brings in from the garden will roll off them. The Big Barker Pet Bed is a welcome rest-stop for all dogs, which are drawn by its canine-friendly features. Big Barker specifically made this bed for older pets, and it is available in plus sizes. It will suit your Golder Retriever, Labrador or Great Dane. The bed comes in various shades of brown and will blend with most furnishings. You can easily make it part of your living room. The company takes the risk of buying on itself by offering a 10-year guarantee. The bed should not lose its shape and loft during this time. It is hand crafted, so there should be no question about its quality. The bed is an orthopedic bed, which makes suitable for senior dogs with arthritis. This machine-washable, microfiber bed is no hassle to clean. The Big Barker Orthopedic bed is sturdy. Many users report being able to press on it without pushing it down to the ground. Dogs sleep in it without making indents. Durable, it will last for many years. Find a bed for a large dog is often a difficult task. This bed is of the perfect size for German Shepherds, Labradors, and Retrievers. People who own Great Danes can fit their dogs in the extra-large bed. It leaves plenty of room for your dog to stretch in. 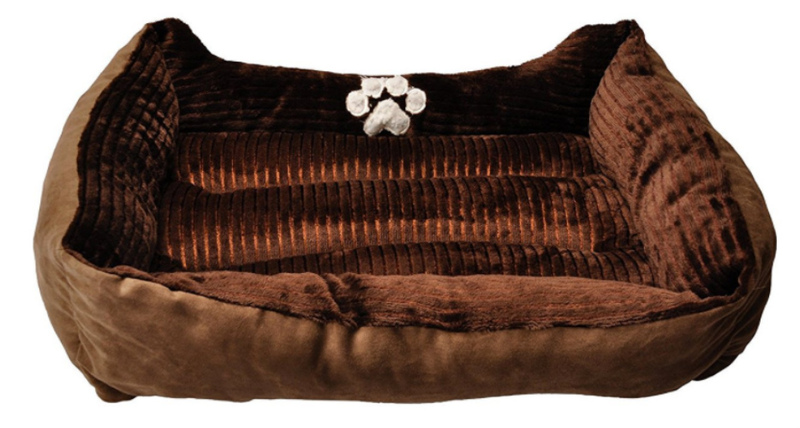 All dogs crave comfort, and this bed is the epitome of luxury. It has a soft headrest that your dog will enjoy. The Big Barker Orthopedic Bed’s pros are obvious. But what other advantages does it have to offer a hassled pet owner? 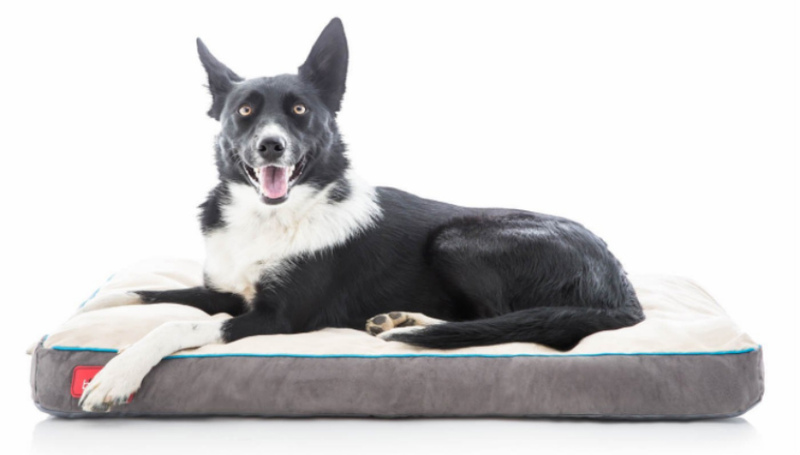 The Big Barker Orthopedic Bed will help your pet improve its mood. Owners report that their dogs, who were grumpy at bedtime, soon wagged their tails and asked their owners to tuck them in. It pleases even fussy dogs, which will stop wandering around their rooms at night. The bed has an easily removable cover, made of quality material. A customer who bought the bed said that it has held up after three years. Also, it does not smell like many orthopedic beds do. It is easy to unpack and set up. Another noteworthy point is the quality customer service Big Barker offers. They let customers keep defective beds, and send them new replacements. No bed will give you everything that you ask, and you may wonder what to consider when buying this one. Note that you may have to practice slipping on the cover. Some customers reported that it is a little tricky. That aside, it is a great bed to get for a few small dogs or a large Great Dane. If you are searching for an orthopedic sleeper, this is one to consider. The Barksbar Orthopedic Sleeper is the ideal mini couch for dogs. The revolutionary sleeper provides both comfort and style. It enables the good night’s rest that vital to your pet’s welfare. This enormous sleeper, at 40 inches long, can accommodate a large dog. If you have a few small dogs and want to house all of them in one bed, this huge sleeper is your best solution. You will find them rushing to cuddle up against one another on it. The Barksbar Orthopedic Sleeper consists of premium materials, so there is no question about its quality. The bed is hand-crafted and made to last. 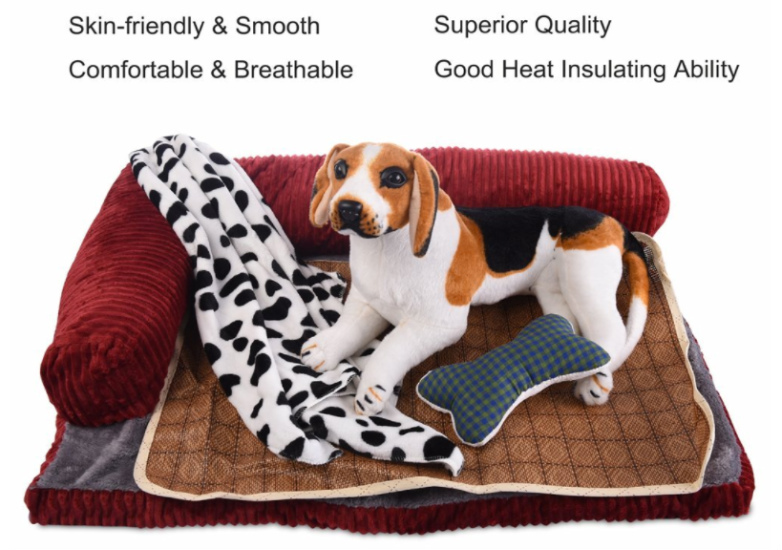 It has a firm Orthopedic foam mattress guaranteed to support your dog’s bones. Note, however, that the bolster part of this bed is not sufficient as a headrest. If your dog prefers uneven surfaces, this may not be the right bed to get. In all, the Barksba property will give a dog the beauty rest it deserves. It is especially useful for arthritic senior pets that need lots of support for their bones and joints. 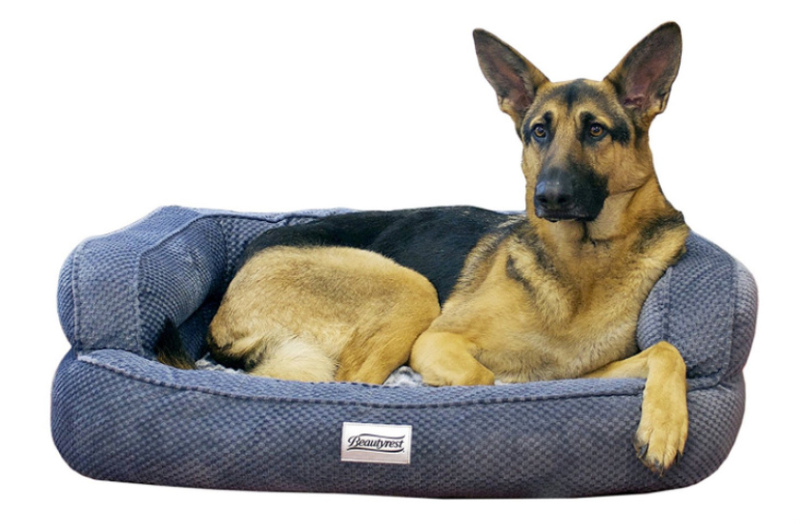 Your dog will idolize you after you introduce it to the AKC Casablanca Round Solid Pet Bed. If you own several pets, you can start a fan club. The bed’s fabulous features will give you a lift. The American Kennel Club produces this bed, which means that it is one of the best beds for dogs. The AKC knows all there is about dog care, so it will set up beds that are perfect for your pet. This durable bed comprises 100% polyester. Made of Casablanca material, it is not susceptible to damage from scratching. That said, it is a good-sized, comfortable bed for small dogs. A top draw is its soft sleep surface. Dogs will enjoy the comfort and stability it provides. It is gentle on your pet’s body, yet sturdy enough to support your pet’s weight. The neutral colors of this bed make it easy to blend with most furnishings. Soft, comfortable and stylish, it will find a place in any room. Round and beanbag like, and at 22 inches, will find a place in your living room. Its neutral color blends in with most furniture. Further, it is easy to clean. It requires just a quick wash and tumble-dry. Pet dander will not stick to it. A quick clean will get it to look as good as new as the day you bought it. Customers love the convenience of this bed. It fits into most washing machines and cleans thoroughly. That it has to-die-for features is evident. But what are its other offerings? 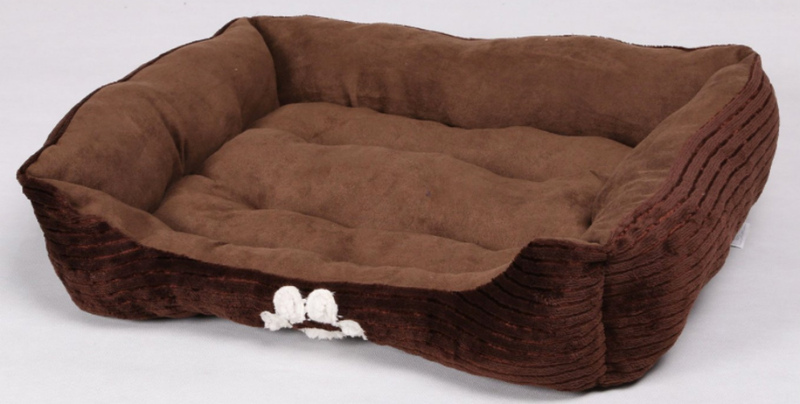 This bed is perfect for pets which like to burrow, as it is soft and easy for them to dig. It will become their haven. It is also durable and does not tear like other beds. Puppies can chew it without tearing it. Its size is another boon. A customer who owns a Shih Tzu and a Terrier Mix found that both dogs could fit into it at once. This bed is small enough for a dog to incorporate into its play sessions and drag around. It is a wonderful source of entertainment. Naturally, you should never rush into making any purchase. There are things to think about before buying this product. One disadvantage of this bed is that it does not have much padding. Massive dogs may thin the bed’s cushion. Another point to note is that though it cleans thoroughly, it soaks right through. A customer whose pet urinated on the bed found that she had to drag it, soaking, to the washing machine. After you weigh the pros and cons against each other, this bed is a perfect hideaway and toy for little dogs. This textile haven is one of the most well-received beds on the market, and it is not hard to understand why. It has a compelling set of draws for pet owners. The bed is reversible. You can use it on both sides. Flip it over if you do not like the brown color. Its neutral tones mean that it blends into any living space. It is stylish with cute dog embroidery embossed on its front. Further, this remarkable bed is easy to clean. It fits into any washing machine and dries almost as quickly as you hang it up. You will not have to wash the dark-brown version too often. The bed has thick, adequate filling. Big dogs can lie on it without flattening it too much. This lasting bed will keep your pet comfortable for some time. Your dog will love the plush headrests that surround all sides of it. At 21 inches and only 2 pounds, it is light enough to bring with you on a road trip. You can keep your dog comfortable wherever you go. Its size is a plus, and it can fit two little dogs. A customer reported that both her Shih Tzus rushed into it at once. This bed supports small dogs, but its softness and sturdy structure accommodate large ones as well. A customer reflected that her boxer could fit into it with no issues. It is flexible enough for your pet to leave its paws hanging over the edge. This product has a paneled floor, which is a plus. It will not go out of shape too quickly. The panel also gives the bed support. Note, however, that the bed may be too soft for some dogs. It will not suit dogs with osteoarthritis or back problems, as they will need extra support for their joints. The walls, though comfortable, are slightly flat. It gives your little pet room to dig. 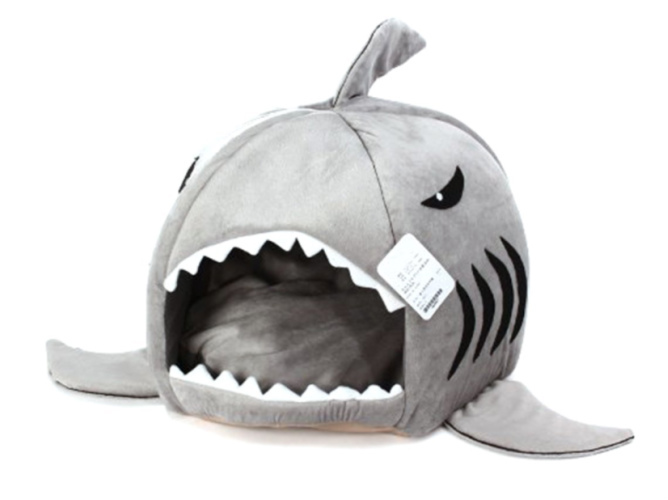 If you have a pet which likes to burrow, this bed might not suit it. It may be unsuitable for dogs who love to chew as it tears easily. The Orthopedic Circle Stitch Gray Cuddler Pet Bed is a hit with pets that have weak bones, and its attractive features explain this. The bed is a product of the American Kennel Club, so you can rest assured of its quality. The American Kennel Club, being go-to consultants on dog care, has a solid grasp on creating comfortable beds for dogs. Further, this bed has an orthopedic, non-skid bottom. The firm orthopedic foam makes it suitable for animals with arthritis. The thick padding enables them to rest without touching the floor. They will not fall or hurt themselves. 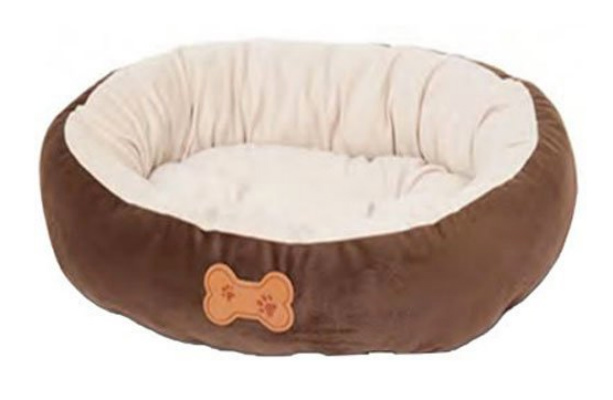 The AKC Circle Stich Cuddler Pet Bed is a breeze to clean. It requires just a quick machine-wash and tumble-dry, on reduced power. You will not consume electricity getting it cleaned. 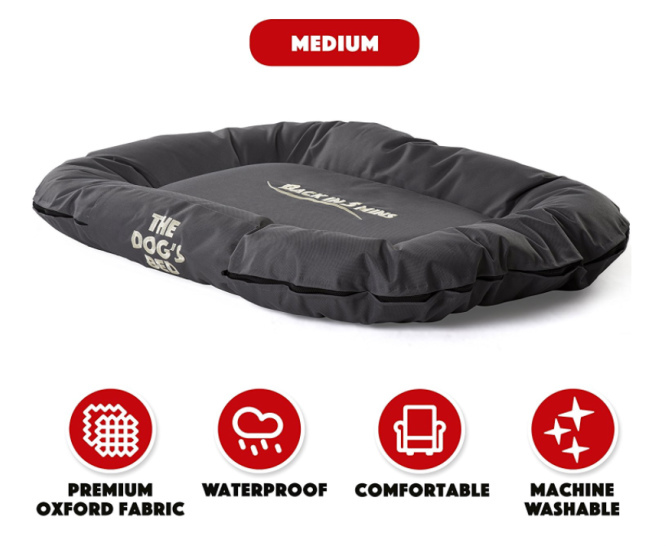 The ultra-thick padding makes it soft and cozy for almost all dogs. At 25 inches, big dogs like retrievers and labradors can fit into it comfortably. It will accommodate your small puppy as it grows. Obviously, this bed has high-end features. But what are its other pros? For a start, it suits pets which prefer flat surfaces. It is thick, yet close enough to the ground. Your pet will not end up touching the floor. This bed so user-friendly because its bottom is not just a flat surface. It has bumps, just like a human bed. Further, its neutral colors allow it to blend with most modern decor. Make it a part of your living room. Your pet will be able to enjoy more family moments with you. Customers love its durability. This bed lasts even when dogs drag it around the house. It has thick, sturdy seams, and is thick enough to withstand rough play. There are things you should note before buying any product, and this holds true with the Circle Stitch Cuddler Bed. There is no entry point for you to flatten the liner, which may make it hard to fit into a washing machine. Also, its undercarriage could use a bit more stability. Everything considered this bed is a value buy for pets which have health problems or prefer to rest their heads on headboards. Does your pet love high places? You may have found the right bed for it. 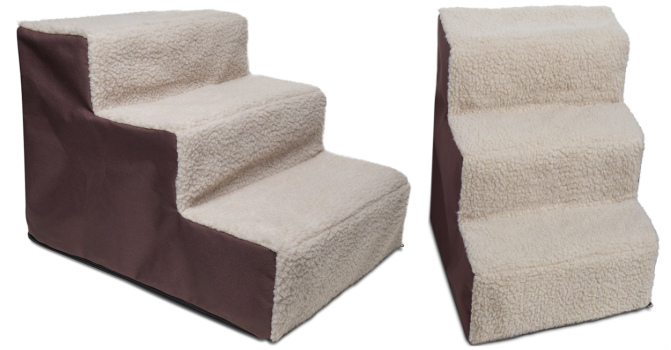 The OxGord portable steps bed will give it the stair climbing edge it needs. This product functions as a bed and stairs. 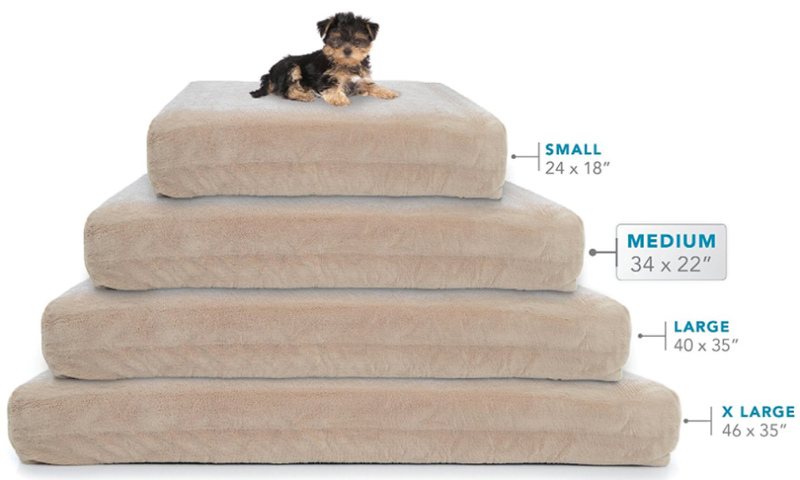 Your pet will be able to climb them and sleep on them too. It will give it the edge it needs to access couches and ledges. It is perfect for pets with joint or back problems because it gives them extra help to get to wherever they need. They can climb it without falling over halfway. Smaller pets will take a shine to it as well. They will love being able to navigate your couch and cuddling up close to you. Should they give up midway, it provides a perfect solution- a comfortable nap. This pet bed is easy to fold and clean. Machine washable, it comes out as good as it did when you first bought it. 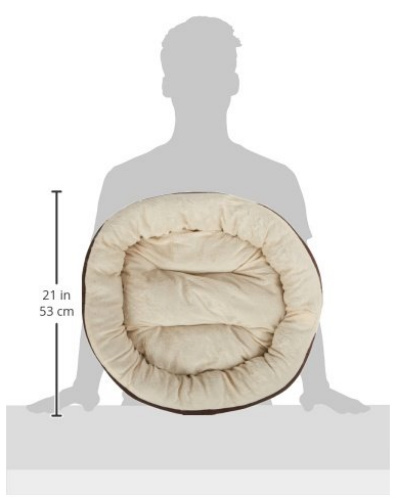 The machine washable cover consists of soft sheepskin, so your pet can rest on it comfortably. Just taking one look at it will show you its advantages. Your pet will take a shine to it, but it has other pros as well. For a start, its neutral colors will make it easy to blend into any living room. You can prop it up against any couch, bed or wall. Since it is foldable, it will be easy to take along with you when you travel. That means that your pet can go along with you and climb anywhere it wants. These soft stairs are safe. Even if your pet falls over them, it will not suffer any injury. They absorb impact. These stairs are great value for money. OxGord has a reputation for manufacturing quality products, so you can rest assured that you will get a big bang for your buck when you buy this bed. Like everything you buy, it will present things to consider. It can be a little high for a tiny Chihuahua or Papillon. All said this is a functional and attractive buy. Do think about this bed if you have an old, small, yet feisty dog which loves to move around. Are you tired of your dog climbing onto your sofa when you have not given it permission? Give it a bed of its own. 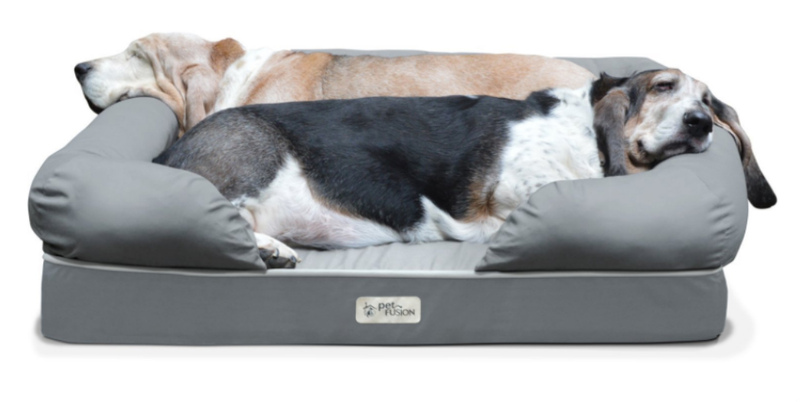 The PetFusion ultimate bed and lounge is the solution you need. Your pet will not need to climb onto your sofa any longer. Take note of its impressive features. 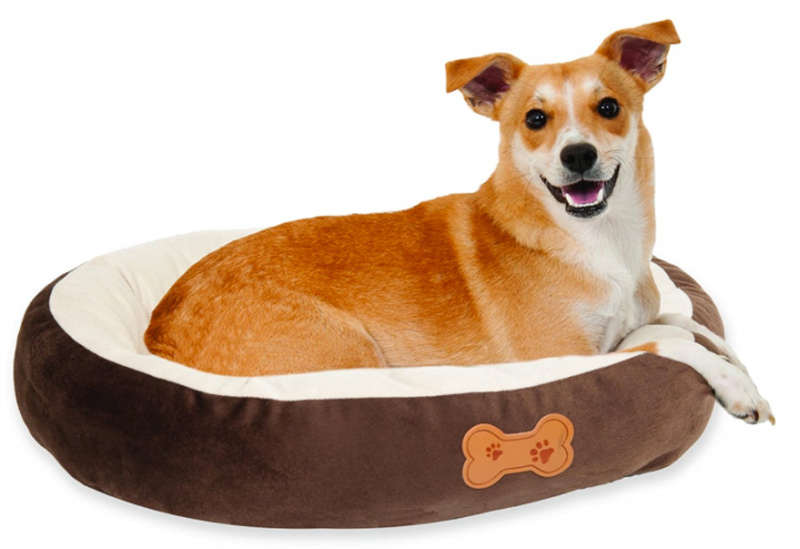 This bed has a thick, 4-inch memory foam that will give your pet better mobility and improved health. It is the ideal bed for pets with orthopedic problems. It can accommodate more than one pet. You will relish its smart design. 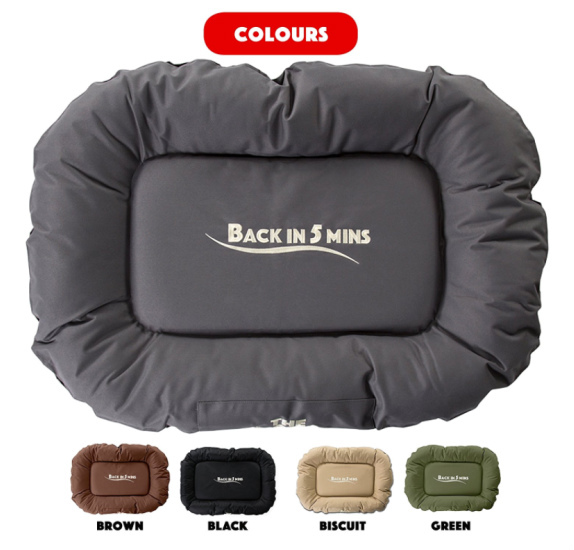 Its base and bolsters will give your pet the support and comfort it needs. It features a non-skid bottom, so you will not have to fear your pet falling over. Further, it looks just like a couch, so you will be able to blend it with your furnishings easily. It is also easy to clean. Just remove its cover and toss it into the machine for a quick wash and dry. It will look as good as when you first bought it. The bed is easy to assemble. All you need to do is insert the memory foam and zip it closed. You will not have to worry about its quality because the manufacturer provides a year-long warranty. Its excellent features aside, there are other reasons this is the perfect bed for your dog. For a start, it supports almost any dog. A customer mentioned that it accommodates her 85 lbs pet. This bed is ideal if you are an owner looking for a single bed that can accommodate more than one dog. One owner mentioned that it supports her three dogs easily. Others mentioned that it is so comfortable that their dogs went to sleep on it at once. New puppies will love climbing over the armrests. Other customers enjoyed its durability and sturdy bolsters. It supports active dogs. Some of them mention that their dogs continued to love their beds even after a year. This bed is perfect for outdoor use. It consists of weather resistant material, so you will not have to worry if it gets wet. Of course, consider every detail before buying a product. Some customers reflected that the cover for this bed was rather thin, and did not support the weight of her dog. It may not be ideal for transport or outdoor use. Note that this bed comes in a small size as well. According to customers, it may be small for some dogs. In all, this bed is a great pick for big dogs or dogs with arthritis. It will be a conversational showpiece in your living room as well. Do you want to have your pet on the couch, but not its hair? This soft blanket is the one for you. Its features should convince you to buy a few straight away. This blanket is of an ideal size. At 76 cm, two small dogs can share it. There will be no need for them to fight over it. You can put the blanket on the couch or bed. It is an ideal solution for those who are hypoallergenic, as it absorbs pet dander from the sofa. This blanket the ultimate travel solution. You can roll it up and take it anywhere with you. Your pet will have a soft, warm blanket to sleep on, wherever it goes. Take it outdoors as well. Are you searching for a present for a fellow pet lover? If you are looking for gift ideas, look no further. Grab a few of these blankets and have them sent to him. They will make his and his furry companion’s day. These features will warm the hearts of any pet owner. But what other draws does it have to offer? It is perfect for small dogs. An owner ordered three for each of her three terriers, which took to them immediately. This transportable blanket is perfect for a trip to the vet. You can use it to swaddle your pet for a frightening trip to the clinic. It is soft and will prove a great comfort. Use it as bedding for a crate. If you are trying to convince your pet to use one, this may help. Lay it in the crate. Your pet will feel as if it is a home and not a prison. This blanket is a winner with a few top features. But do have a few thoughts in mind before buying it. It may not be thick enough for big dogs, so do measure your pet’s weight before making a purchase. Big dogs may compress it and reduce the distance between the dog and the cold floor. 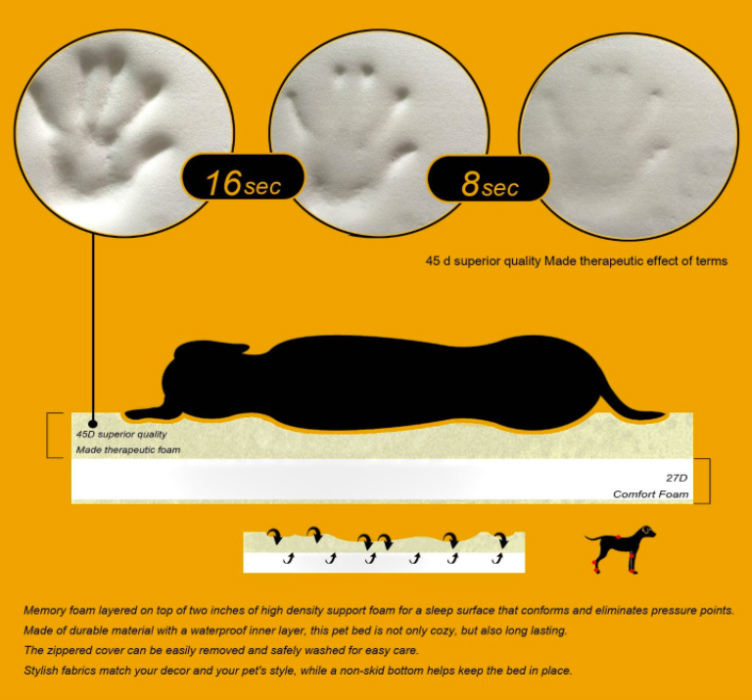 The mat comprises a soft material, so do not get it if your pet loves to scratch. It may tear a few holes. This blanket is value for money, and your pet will love you for buying it. You will be able to take it along with you on your next road trip. Does your pet spend over an hour climbing the stairs because of its aching joints? The Millard Pet Orthopedic Bed may be the solution for its problem. This bed offers support for its aching joints. The quality memory foam it is made of will prevent it from sinking to the cold floor and putting pressure on its already aching limbs. Further, it follows the contours of your pet’s body, ensuring maximum support. The cover has a non-slip bottom to protect it from nasty falls. Millard has a reputation for using top-grade materials. The memory foam receives an endorsement from CertPUR-US. Rest assured that it is a quality bed that will last. Are you fed up of removing dander from your pet’s bed? 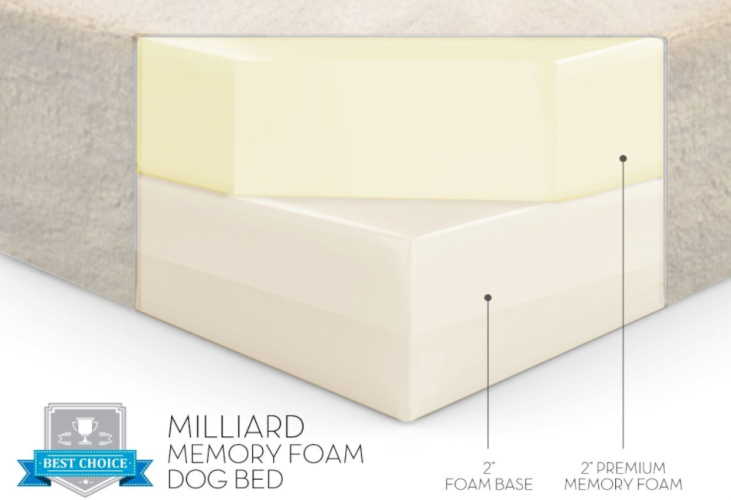 With the low-maintenance Millard Orthopedic Pet Bed, you can get rid of it completely. This bed is machine washable and will look as good as new after a quick clean. It dries fast as well. The Millard has features that will compel you to buy it. But what are its other pull factors? No matter what size your dog is, it will fit into the bed. It comes in small, medium, large and extra-large sizes. 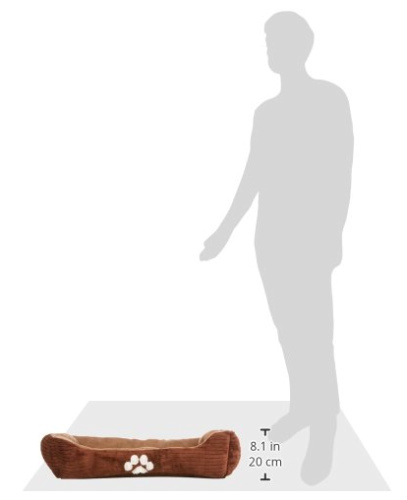 All you have to do is measure your dog and pick the bed that comes close to its measurements. The bed can absorb the weight of most dogs. Am customer mentioned that her 50-pound lab could fit into it with no issues at all. The cover is completely waterproof, and you can use it outdoors. It is foldable. You can bring it, and your pet with you when you travel. The bed does not have irritating lumps and bumps. Your pet will enjoy its evenness and will go to sleep in minutes. Owners like that it maintains its shape after a wash.
As you should when buying any product, do consider a few points before buying this one. Do not get it if your pet is incontinent because you may have a few problems if your pet has an accident. It retains an odor. In all, this bed is good value for the money. It will ease your pet’s arthritis or back problems. 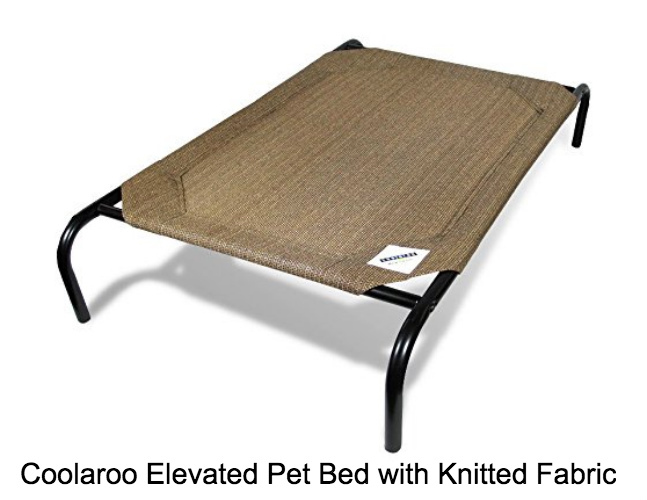 The Coolaroo Elevated Pet Bed is unique as it is comfortable. It will prove to be a bed that your pet will take to immediately. This bed is off the ground and will keep your pet comfortable. The air flow around it will be a relief on a warm day. Further, the elevation is a boon for a pet with arthritis, as it will reduce any impact on its painful joints. Further, it comprises knitted polyethylene material and will eliminate hot spots. Your pet will adore this bed on a hot day. Does your dog have an occasional flea problem? This bed will scare off its”unwanted friends.” Flea and mite resistant, it is easy to keep clean. This low-maintenance bed is washable. The steel frame that it comes with is lightweight, yet extremely durable. It is easy to assemble. There will be no issues about your pet falling, as the bed will support it. The powder-coated frame is portable, making it suitable for use both indoors and outdoors. Blending it into any living space is not a problem. It comes in five designer colors, so you can pick one that best suits the theme of the room where you want to install it. 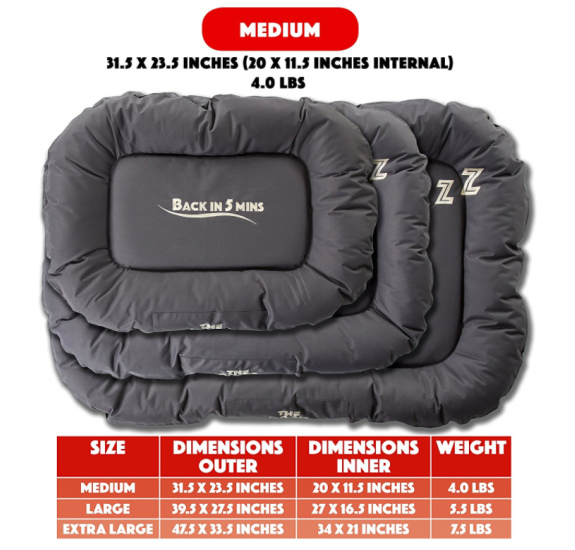 It comes in three sizes, ensuring a comfortable fit for your pet. It suits both large and small dogs. The Coolaroo has features that will draw you. But what are its other pros? 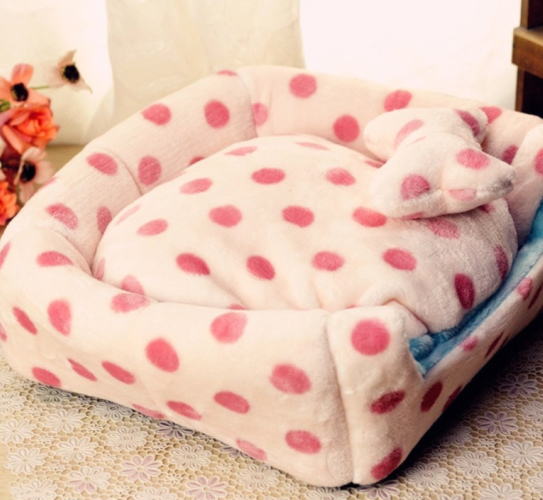 It is so comfortable that your pet will want to lay in it straightaway. Customers report that their energetic pets wanted to rest in it. Customers attest to its durability. One mentioned that it has lasted even though he bought it a few years ago. Your pets can use it as a trampoline without damaging it. They will not hurt themselves either. This bed is easy to put together. All it takes is attaching the fabric to the suspended frame. You can carry it with you and place it anywhere you want. 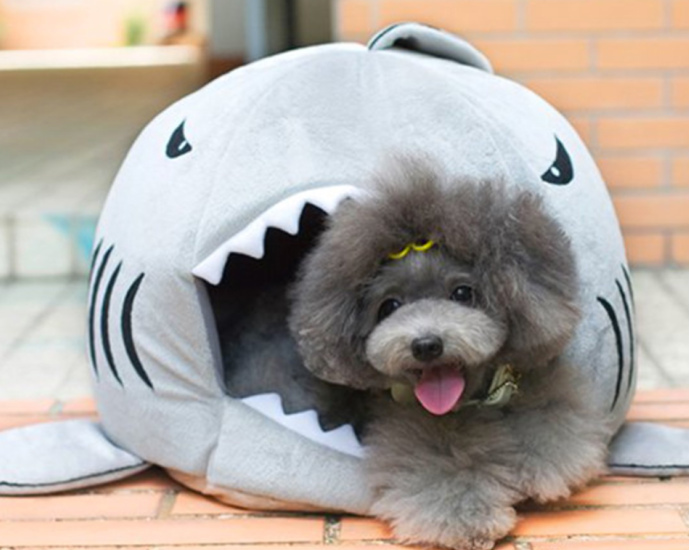 Your pet, without question, will allow this gray shark to swallow it. And it is not hard to see why. For a start, this bed comprises top-grade, cotton filler fiber cloth, and will absorb the weight of almost all small dogs and puppies. It will fit Little Papillons, Chihuahuas and Chinese Cresteds like a glove. The Gray Shark bed is a useful one for cold winters. Made of self-warming material, it works like a sweater and will keep your pet warm. Spexpet, the makers of this bed, has filled it up for your pet’s optimum comfort. With such thick padding, your pet’s body will not touch the floor as it sleeps. Pets with osteoarthritis will benefit. The filling will protect and warm their joints. Moreover, it is anti-slip and damp proof. Your pet will not take a tumble when it tries to get up. It comes with Leegold bulk packing and Spexpet’s warranty. There is no question about its quality. You will find this product one of the easiest pet beds to clean. It is machine washable and will still look as snug as it did when you first opened the package. This Gray Shark has features that will draw you to it. It has other pros as well. For a start, it will be the focal point in any room. Your friends will giggle when they start to talk about how cute your pet looks inside it. Your big pet will love getting into it, no matter how difficult the task is. It will enjoy hanging out of it. Blending it with the rest of your furnishings is easy because of its neutral gray color. Another boon is its removable cushion. You can take it out when your pet wants to sleep outside it. You and your pet will appreciate its versatility. Spexpet’s quality service will impress you. Many customers remarked that the product shipped faster than they thought it would. They like the quality packaging it came in too. Any product that does not leave you something to think about is probably too good to be true. Do not use this shark outdoors. Note too, that it only absorbs weight up to 4 kg. Does your pet struggle with jumping? Is it always trying to lie on your thick sweaters to soothe its joints? It needs the memory soft foam bed by Brindle. 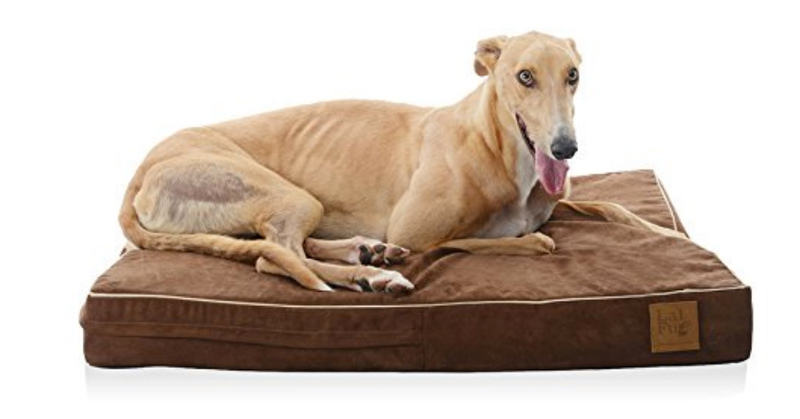 This bed has a 3-inch, thick layer of shredded memory foam that will reduce weight on your pet’s painful joints and increase its ability to breathe. It will keep your pet comfortably off the floor. Further, it conforms to your pet’s body, giving your pet support. Its consistency provides relief for dogs with dysplasia or dislocated joints. The microsuede cover that it comes with is easy to maintain. All it needs is a gentle wash and tumble-dry in your machine. It will look as good as it did when you first received it. It retains its shape and density. To add, it is ideal for use outdoors. Lightweight and portable, you can take it anywhere with you. It is compatible with crates for medium sized dogs. Your pet will be able to join you on your next camping trip. Brindle is so confident of this product that it is willing to back it up with a three-year warranty. Return it during this time for all your money back. The Brindle bed has to-die-for features. But those are not all. It has other draws too. The bed is of the perfect size for small to medium-sized dogs. A customer mentioned that her Beagle could stretch out on it comfortably. It comes in neutral tones like stone and khaki, so it will not jar with the furnishings in any room. The shredded memory foam does not dirty quickly. A customer mentioned that she could remove the stuffing if she needed to wash it. The bed has well-sewn compartments that will keep the foam in place. This bed is most suited for small dogs, but larger ones can rest on it as well. A user reflected that her Siberian Husky loved it, even if it was tiny for him. Of course, you should consider everything about the Brindle Memory Foam Bed before buying it. Note that this bed may not be suitable for you and your dog if it is used to a solid piece of foam. You may feel that the shredded foam may not support your pet’s joints. In all, this bed is comfortable, yet functional. It will give you good value for your dollar. Are you looking for a bed that is durable, comfortable and portable? The Petacc Detachable Dog Bed is your top choice. This bed is Petacc’s 4-in-1 offering. It is a bed, outdoor sleeping mat, pillow, and blanket. It will keep your pet comfortable no matter where you use it. Further, it will last. The design is unique, yet functional. This bed suits all medium-sized dogs of around 55lbs. 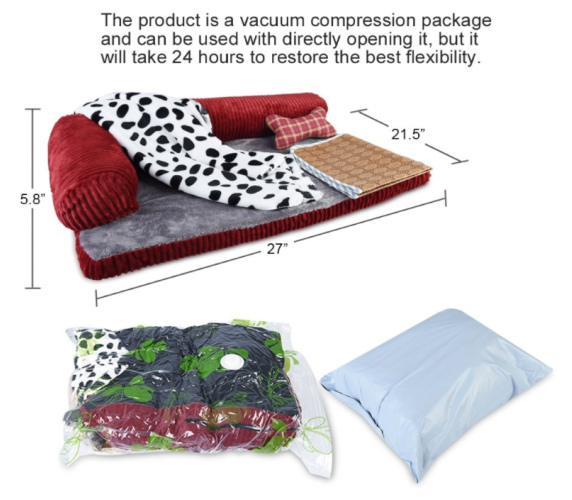 It will provide your Beagle, Corgi, or Spitz a perfect night’s rest. You will not need to worry about it tearing because Petacc has made it out of superior corduroy. The sponge stuffing will not damage easily either. Your pet will feel as though it is sleeping with its mom. And that is not all. 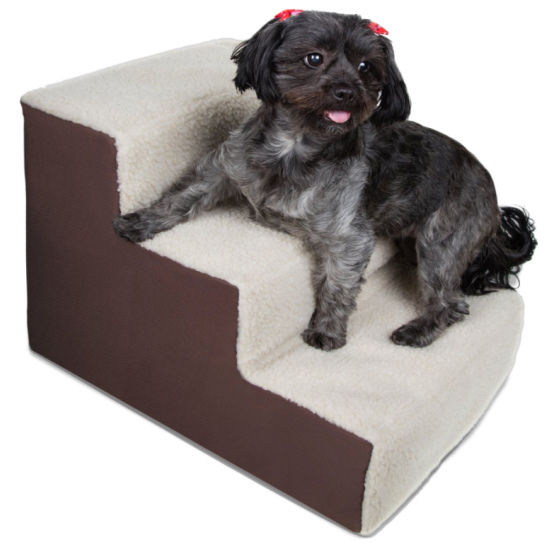 The Petacc Detachable Dog Bed has an anti-skid bottom that will prevent your little friend from falling. It also has lots of plastic points to keep moisture out, so you can use it outdoors. Caring for this bed is no headache at all. Just remove the detachable bottom for a quick wash in the machine. This bed has enticing features. It has other convincing pros too. The material is soft, yet durable. It is comfortable, yet will not tear no matter how your pet scratches it. The unique design will be a conversation starter. Your guests will enjoy chatting about its uniqueness, and your dog, if you leave it in your living room. The bed, according to customers, holds its shape after much cleaning. The top grade cover retains its form and density. Unlike other dog beds, this does not have any offensive odors. Your pet can use it right away without you having to wash it. Like all other products, this bed may give you some things to consider. Note that it is for small to medium-sized dogs, so do not waste money getting it for your Labrador. He probably will not fit in it. Another customer mention that the bed is too slick, despite its non-slip bottom. It may not stay on a leather couch. All said this is a value buy that your furry kid can use at any time. It combines form and function. This bed is a bed for all dogs. You and your pet will fall in love with it as soon as you remove it from its package. It is a top-grade bed that comes in a range of neutral, yet fashionable colors. It will blend with the theme of any living space. Fit it effortlessly into your modern, luxury apartment. Any dog can fit into this bed. It comes in small, medium, large and extra-large sizes. All you need to do is measure your dog, and order the size that best fits it. Rest assured that this is a quality product. The outer cover comprises Oxford Fabric, and it has an outer, waterproof coating. It will keep its form and appearance after each wash. 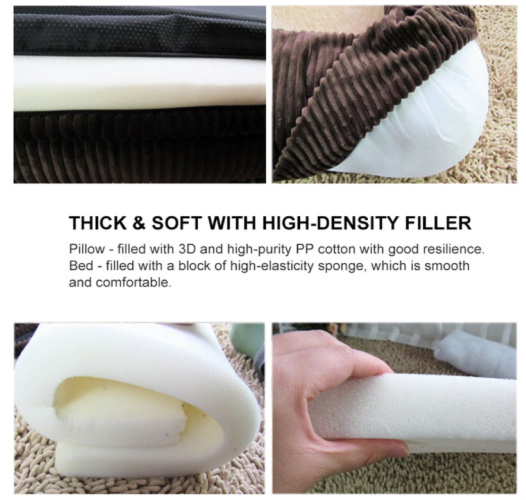 The solid, dense foam mattress that conforms to your dog’s body. It comes with a comfortable Dacron pillow as well. The Dog’s Bed uses only top quality materials. The manufacturers chose them because they prevent choking hazards. The bed goes through rigorous testing before being sold. The Dog’s Bed has top-of-the-line features that will draw you. But wait until you find out about its other pros. Your dog will be able to come with you on your next camping trip. The Dogs’ Bed comes in a variety of neutral tones, so it is easy to make it part of any living space. It will look like one of the lovely throw cushions you throw into your urban bedroom. You will also like that a big dog can fit in it. A large or extra large bed will accommodate a German Sheperd. It goes into most dog crates, so you can take it with you when you travel. Of course, you should ponder over a few points before buying this bed. For one, the fabric may be a bit hard for some dogs. It also takes some time to set up. In all, it is a versatile bed that unites style and practicality. This bed is a haven that your big dog will love. Little dogs will adore it too. If your dog has trouble with its joints, this bed is the one to soothe them. It follows the contours of your dog’s body and gives them ample support. The thick, padded memory foam will prevent your dog’s limbs from hitting the cold floor. You will also love its couch-style design. In a Silver Jacquard color, it will blend with the furnishings in most rooms. Your guests will assume that it is another lovely beanbag they can use. If your pet is prone to falls, this is the bed you need. It has a non-skid bottom, so your arthritic pet will not slip and fall. To add, it has a low-profile front that your pet can access. At 36 inches, it will not take up much space in your room. 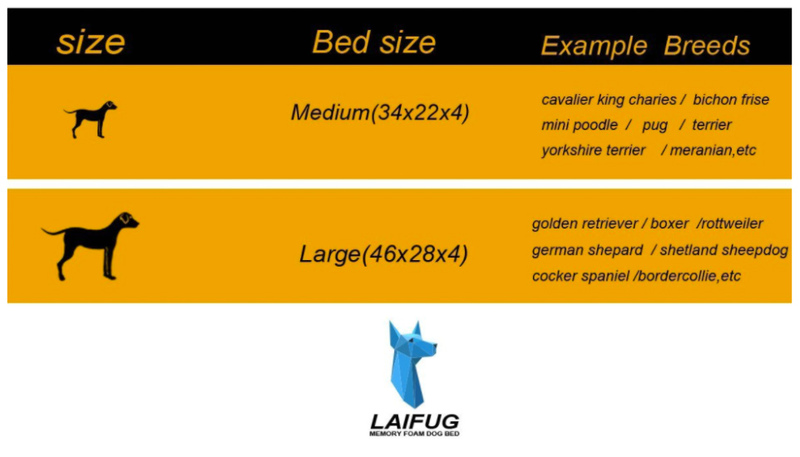 In any event, do measure your dog, and the area where you want to put the bed lest it cannot fit. This product has astounding, practical features, but wait. There are other pros. It comprises quality materials, so you can rest assured that it will last. It is soft where your pet lies down, yet firm around the perimeter. It is durable and holds up well after many months. With the support it provides, it will provide the rest that a senior pet needs. Your older dog will be able to ease its aching bones. It is washable and fits any machine. It will look renewed after a good cleaning. Note that it is advisable to let it air dry. It fits large dogs of about 45 lbs. Your Retriever or Bull Terrier will fit in it comfortably. As you should when using any product, do note a few details before buying the Simmons Beauty Rest Orthopedic Bed. It comprises memory foam, so it may need a little fluffing up before use. Do note that it should not be used outdoors as well. If you have a dog of an enormous size, such as a Great Dane, do avoid using it. Does your pet rest its head on the side of its bed? 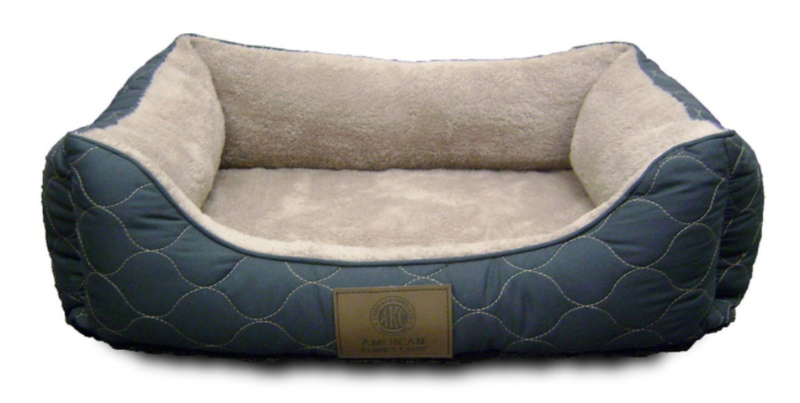 The Aspen Oval Pet Bed may be the one you need. This bed has raised, padded sides to promote sleep. If your pet loves to curl up and put its head on the side of its bed, this bed will provide support. The polyester fiber fill will relax your pet. Durable, it retains its shape after a wash. The padding is thick and will keep your little friend off the cold floor. It will ease its painful joints. Further, it is washable. This bed will still look the same after a tumble in your machine. Dander and pet hair fall off it at once. You will love its neutral brown color, which will allow you to blend it with most furniture in your home. A look at the stylish bone motif on the front will tell you that it belongs to your pet. At 20 inches, this bed will suit all small dogs. Your pet Chihuahua or Papillon will take to it immediately. Even large dogs will be content to use it as a pillow. Aspen’s oval pet bed has fabulous features, but those are not the only reasons why you will love it. It has a soft, fiber-padded bottom, which customers’ pups love. The dogs will enjoy the side support as well. The bed may look small but will fit a little dog of about 18 inches perfectly. There is room for stretching as well. It does not take up space and is not too big for any room. Customers enjoy its updated design. The Aspen Oval Pet Bed is a boon in cool weather. The fiber-padded sides will give it sufficient warmth. You will enjoy the durability of this bed. One customer remarked that her dog tried to chew it, but was unsuccessful, It chose to rest comfortably in it instead. Customers like that it does not collect dirt like other pet beds. It is low maintenance and easy to clean. Of course, do consider all aspects of a product before buying it. 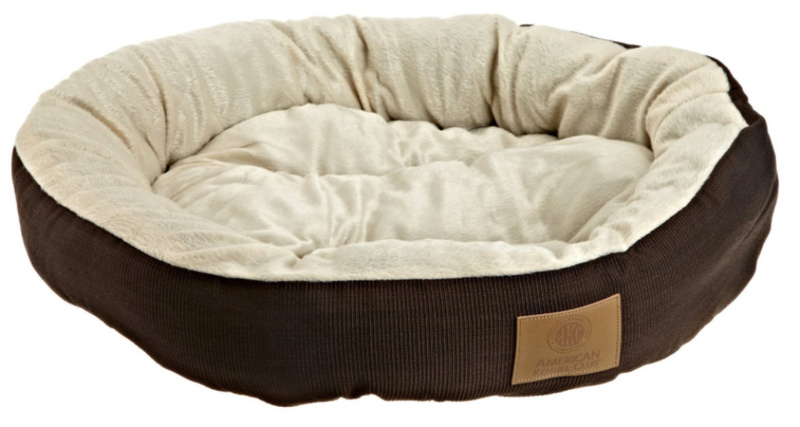 The Aspen Oval Pet Bed will present points to ponder. Comfortable as it is, this bed is for small dogs. It will not be a wise choice for your Labrador. Do take note that you should not use it outdoors, as it is not foldable. The bed is spacious for little dogs, which may prefer to snuggle in the back. It is ideal for terriers and other small dogs that have burrowing instincts. Of course, there is much to consider before buying any product. Do so before putting this slipper bed in your living room. For a start, not all dogs can use it. This be will disappoint you if you are hoping that your German Shepherd will get into it. Note too, that this bed is rather lumpy. Some customers reflected that it could not stay upright. If you want a simple, fuss-free bed for a little dog that loves to burrow, this is the one to choose. If your pet always goes with you on road trips, the Maxx Ultra-Rugged bed is the one for you. You can use this water-resistant, Polyester bed outdoors. Your pet can accompany you on your next camping trip. You will not have to worry if your pet pees on this bed because it is odor resistant. This bed will accommodate big-sized dogs. It supports dogs of up to 70 pounds, so your Lab or retriever can rest on it without it compressing. The polyfiber with no-dip, rubber grip makes it perfect for hardwood floors. It will not slip beneath your pet. You will love the convenience of this low-maintenance bed. It is machine washable, and springs back into shape after a cleaning session. It comes with a 1-year warranty from the manufacturer. This bed has features that are perfect for the outdoors. Wait till you learn about its other draws. Its high durability is a plus. Customers love that it withstands frequent digging. One user remarked that it withstood her dog’s chewing and has no holes at all. The hypoallergenic materials are a boon. 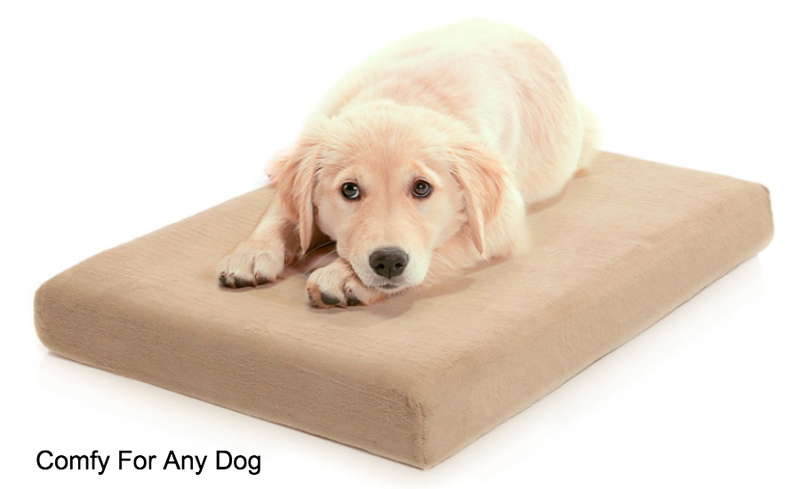 Customers were glad that their pets could sleep on it without triggering allergic reactions. Further, your dog will not make noises when scratching it. Of course, you should know everything about a product. Note that this bed may not fit all dog crates, so measure yours before buying it. In all, it is a lasting bed that you can use outdoors. Does your Retriever feel a strain in its joints as it walks? Does it struggle to climb stairs? It needs the Laifug Orthopedic Memory Foam Pet Bed. This bed will relieve your dog if it suffers from joint stiffness or arthritis. It comprises thick, padded memory foam, which has a 2-inch, supportive base. It will keep your pet off the cold floor and warm its limbs. Factories use chemicals to manufacture products. Some of them are hazardous. Rest assured that you and your pet will not interact with them. Certified free of harmful chemicals, this bed is safe. You will enjoy its chic design.It comes in a variety of colors, and blends with most decor. Place it anywhere in your living room or bedroom. Beds for big dogs are rare. Your Great Dane will relish this caters to large dogs. The convenience of this bed is hard to beat. You will love that it is machine washable. The covers are removable and are clean with a quick wash. The Laifug Orthopedic Bed has a host of fantastic features, and it has other pros too. You will appreciate that it is even, and not lumpy. Your dog will be able to sleep without tossing and turning. 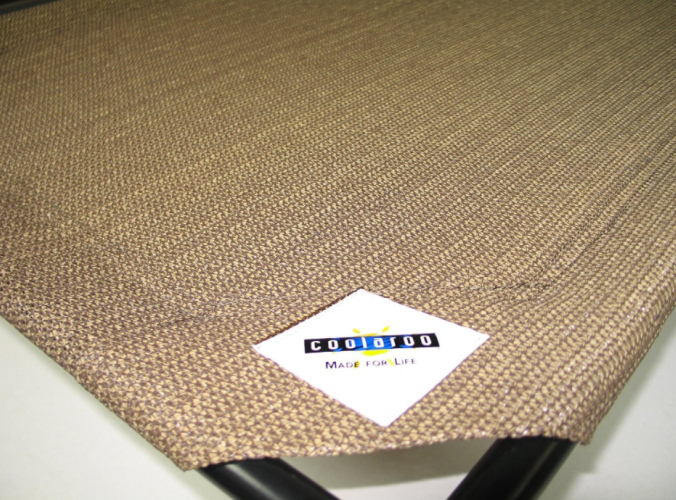 The Laifug Orthopedic Bed is durable. It has a machine washable cover and will last no matter how much your dog’s nails tear at it. The bed retains its shape no matter how many times you wash it. You will love the easily removable and washable cover. Since you can clean it quickly, you can use it anywhere. It is water-resistant. The bed fits into crates for big dogs. You can bring your dogs on road trips. Users loved that the bed could support their large dogs. Labradors of over 60 lbs could use it. It does not compress easily. Of course, you must consider everything about a product before buying it. The Laifug Orthopedic Bed has to expand to its full size. It has a heavy smell, and its zipper may break if you pull it too hard. It all, it is a top quality bed, functional and worth the money you pay for it. Give your room a feminine touch by adding this bed to it. The Kaka Pets Bed is a kennel. 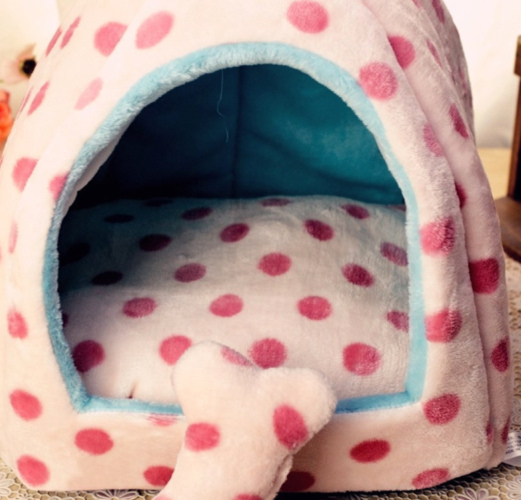 Dome-shaped and cozy, it is a place your pet can call its own. It fits most small dogs. If you want to add feminine zing to your living room, this is the bed that will complete it. The cute, polka-dot design is photograph-friendly and enthralling. It is the perfect finishing for a little girl’s room. Your pet will enjoy how warm it is. The polar fleece material will keep it snug. It is durable and will last no matter how many times you wash it. It can house puppies and small dogs. All you have to do is find the correct size. The little bed fits tiny pups while the big sizes fit Terriers and Schnauzers. The bed has sufficient padding and will keep your pet off the floor. It will give an arthritic pet comfortable support. Your pet will love how deep it is. If it likes to burrow, it will enjoy hiding in the back. 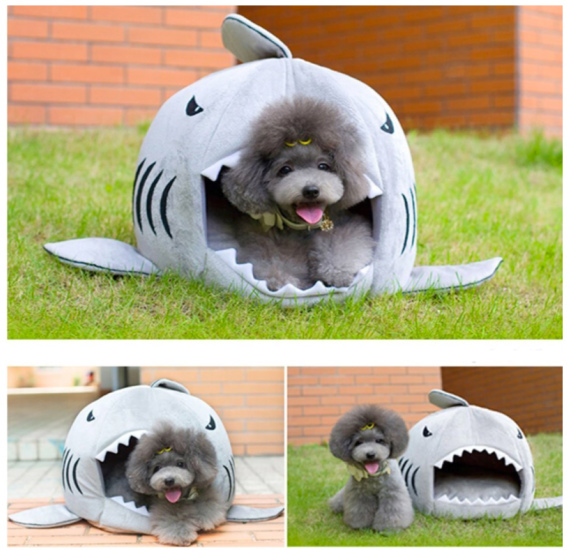 It will become your pet’s favorite hiding place. The Kaka Bed has top features, but what are its other draws? You will find this product value for money. It comes with a toy, which your pet will appreciate, and a soft, comfortable pillow. This bed is foldable, and you can store it quickly. It is usable anywhere in the home. It will keep your pet comfortable on road trips. Kaka’s responsive service pleased customers. An owner who found the bed too small received a quick refund. Customers loved how cute it was. The rose polka dots proved to be too much for female customers to resist. Of course, there are things you should consider before buying any product, and you should certainly do the same before buying this bed. Do measure your dog carefully before buying it. Some customers found it a bit too small for their dogs. Fold the bed carefully. A customer mentioned that it does not retain its shape. You need to unfold it carefully to help it stand. All said, it is a useful Bed for puppies and chihuahuas. It looks charming as well. Your pet will love the Furhaven Pet Mattress because it is as furry as your pet is. Your pet will adore the faux fur surface. 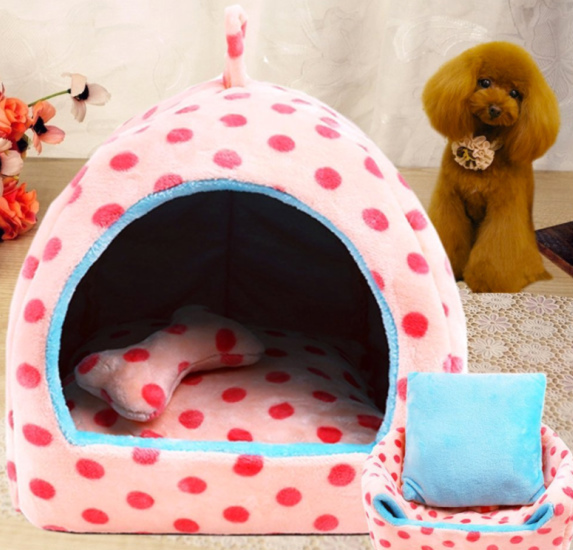 It is luxuriously cozy and will keep your pet warm. It can double as a cushion for your living room.The faux fur comes in a variety of colors and will blend with most furnishings. You will love its updated, stylish design. Made of orthopedic foam, it will give your pet’s joints the support it needs. The durable, thick egg-crate foam will keep your pet off the floor. The cover is removable, and hand washable. It keeps its shape no matter no many times you wash it. The foam is hand washable, so your bed will always smell fresh. Flattened beds can put your pets too close to the ground, which may be cold. It may trigger joint pain in dogs with arthritis. The bed will not flatten no matter how much weight your dogs put on it. The convolute material protects eggs and will do the same for your pet. This bed will support dogs of most sizes. At 27 inches, it can fit in most living spaces. Labradors and retrievers can sleep on it, even if they hang slightly off the sides. You will enjoy the low price of this bed. Faux fur is not easily available at such a price range. This bed has top-of-the-line features, and other draws, according to Furhaven’s customers. The egg-crate material is soft, and your dog will take to it at once. It still gives support for aching joints. Customers love that the material is firm, and will not collapse under their pets’ weight. Your older dog will take to this bed. If it cannot jump on your bed anymore, this bed is soft, warm alternative. It will comfort its aching joints. Customers love the convenience it brings. They can easily remove the cover to wash. They loved that it is waterproof, so they can take it outdoors. The size of this bed is a draw. A customer reflected that it fits her Siberian Husky. The bed will keep your dog so contented that it will not want to jump on your furniture. This bed has draws though you should always take everything into consideration when making purchases. Note that this bed makes a noise when a dog jumps on it. In all. It is a perfect haven for a dog. There are endless safe, comfortable pet bed options. These selection tips and recommendations are just what you need to choose the right bed for your furry friend.